After I left active duty with the Navy in November of 1969, we moved back to Houston, where I worked during the day and went to law school at night. I found a job as an electrical engineer with the Thermon Manufacturing Company, which sold electrical heat-tracing systems that were used in refineries to keep the pipes at a set temperature so that the products they were manufacturing would stay in liquid form as they moved around the plant. One of my accomplishments while working for there was to introduce the first use of a time-share computer to do some of their computations. My job was to design these heat-tracing systems and then go to the job site and supervise the installation of our equipment. One job took me to Boulder, Colorado in the middle of a serious winter storm. We even had arctic gear given to us to wear when outside. That was the trip that convinced me to never move back to the North again. 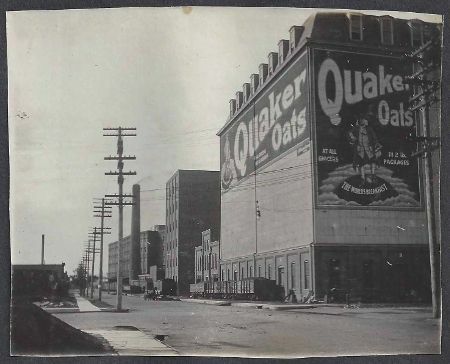 My favorite assignment was when I was sent to Iowa to the old Quaker Oats plant where they were having trouble with Cap'n Crunch's new peanut butter flavor. The peanut butter had to be sprayed on the cereal but the pipes carrying it to the spraying machine kept clogging up. When they figured out the perfect temperature for the pipes to be maintained at they came to us for the heat tracing solution. I designed the system, supervised the building of it, and then went to Cedar Rapids, Iowa to help install it. It's hard to describe that old plant, but the headline is that it was something out of the previous century. Basically it was just a huge, six or seven story old brick barn. There were no stairs between the floors. Instead they had several large, vertical conveyor belts that ran from the ground floor to the top floor. There were little platforms attached to these belts, and we would hop on one, holding on to one that was higher up on the belt, and then we would have to jump off on the floor we wanted to get to. If you missed your floor you had to get off on the next one, and then ride the other side of the belt down. Once installed, our system worked as designed, and the peanut butter finally flowed as it should, eventually making that product their number one best seller for several years. After I returned home, I received a very formal letter from the Quaker Oats Company thanking me for saving their peanut butter crunch line. And that letter was signed by Cap'n Crunch himself. For a time that letter made me a big hit with my children, who most likely have no memory of it yet today. But I must admit that I was proud to have served Cap'n Crunch so well.